A 17-year-old male is being charged as an adult over a crash that killed a 60-year-old woman in November. 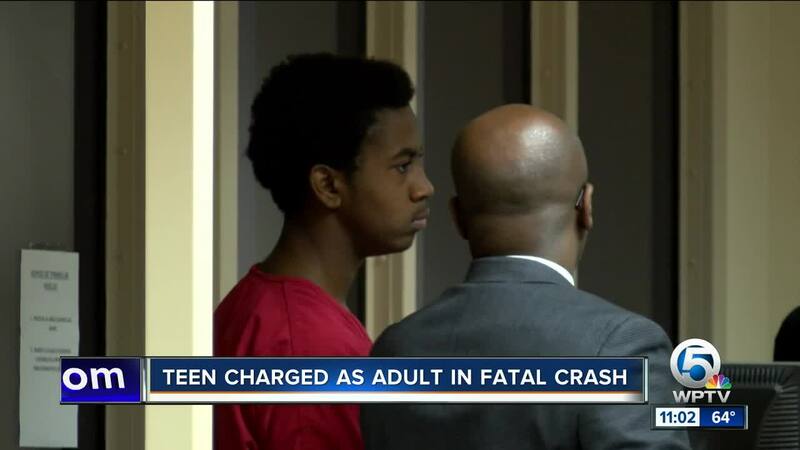 WEST PALM BEACH, Fla. -- A 17-year-old male is being charged as an adult over a crash that killed a 60-year-old woman in November. Tre'on Morgan, 17, is charged with vehicular homicide, grand theft and fleeing and eluding law enforcement. Investigators say Morgan stole a vehicle from a Jupiter gas station on November 28, 2018. While fleeing from police, Morgan ran a red light and crashed into another vehicle, killing Debora Eber of The Acreage. WPTV is identifying Tre'on Morgan because he is being charged as an adult. Morgan appeared before a Palm Beach County judge on Saturday morning. He is being held on a $300,000 bond. According to police, a 14-year-old boy was also in the stolen vehicle with Morgan. It is unclear if that teen will also face charges.